Plot When Lakshmikant Chouhan realizes that the high price of sanitary pads has forced his wife to opt for a rag during her menstruation, thus compromising on her personal hygiene, he invents a low-cost sanitary napkin-making machine and affordable pads that give women the sanitary comfort they deserve. Borrowing from Twinkle Khanna’s short story ‘The Legend Of Lakshmi Prasad’, mixing it with the real-life story of entrepreneur Arunachalam Muruganatham, adding in a handful of quirk and some A-list actors in the plot, R. Balki brings together ‘PadMan’, a movie that belongs solely to Akshay Kumar. The ‘Khiladi of Bollywood’ takes quite a risk by signing a film that deals with a taboo topic, but it all pays off in the end. In an MP village called Maheshwar, a school drop-out and a mechanic by profession, Lakshmikant Chouhan (Akshay Kumar) has recently gotten married to Gayatri (Radhika Apte). A staunch believer in traditional values and rituals, Gayatri alienates herself from her daily chores, including pooja-paatth, every five days of each month and it does not take long for Lakshmi to understand what the problem is. Lakshmi also wonders why Gayatri opts for a dirty rag when sanitary napkins are available by the dozen and he brings home a pack of sanitary pads for her to use when she is on her period. The wife throws a fit and when he realizes they might disrupt their monthly budget, he promises to not only change the way his wife maintained her personal hygiene but also bring about a revolution that would help other women in the long run. “Tum mere liye itna achchha malpua bana sakti ho, toh kya main tumhare liye sanitary napkin nahin bana sakta?” Lakshmi questions Gayatri, much to her chagrin, because it is forbidden to even talk about women’s sanitary issues. But Lakshmi being Lakshmi; he works relentlessly to find a way to make affordable, low-cost sanitary napkins that would not just give women better menstrual hygiene, but also provide them freedom and employment, which is something that has never happened in Maheshwar before. Lakshmi employs indigenous ways and methods to bring about a change but his villagers are angry and his wife is peeved. He faces rather odd obstacles – Is the man into superstition? Will he able to deliver what he promised? Why would a man be so bothered about women’s menstrual issues? And so people start ridiculing him and calling him a madman, threatening him to banish him from the village. An MBA student and table player Pari Walia (Sonam Kapoor), who wants to become the change agent, lends more than a helping hand to Lakshmi as she enters into his life, finally giving him the wings that he needs to fly and Lakshmi goes on to become Pad Man, bringing laurels not just to his village but to India on the whole at the UN! 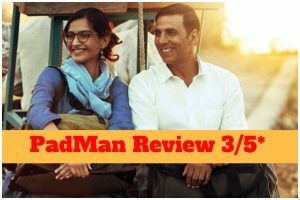 Balki’s ‘PadMan’ has its heart in the right place and he succeeds in telling the story of an ordinary man, who rose above the extraordinary only to provide his wife with comfort and keep her from harm. Akshay Kumar brilliantly portrays Arunachalam Muruganatham in all earnestness and Balki does not leave any stone unturned to make sure Akshay does perfect justice to his story. Radhika Apte is first rate, but her character could have had more depth. Sonam Kapoor, on the hand, impresses, although her romantic angle with Akshay seems a bit out of place in the film. Balki takes a few cinematic liberties in bringing forth a simple story and sadly though, they show in the film. The dawdling first half could have been sped up and a few songs could have been chopped off to keep the screenplay on track. Amitabh Bachchan’s cameo too, does not fit in with the storyline. However, it is the second half that grabs your attention and makes you appreciate the silent social change that Muruganatham brought in with his idea. To put it all together, ‘PadMan’ is worth a watch for Akshay’s performance and Muruganatham’s efforts. Not all superheroes wear capes; some wear sanitary napkins too! 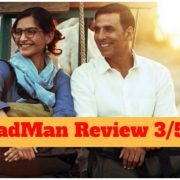 The post PadMan Movie Review[3/5]: Akshay Kumar Shines In This Feminine Hygiene ‘Period’ Movie appeared first on Eventznu.com.